Synopsis 'Purposeful Practice' is a phrase used by the English Bowls Coaches Society (EBCS) to encourage coaches to help their students to practise effectively and the idea for this booklet came about following attendance by the author at an EBCS coaching course. It consists of 20 illustrated exercises, ranging from 'Draw inside/outside front bowls' to 'Hidden jack', and four extra exercises including 'Conditioned singles', where conditions are agreed before the start of an otherwise normal game. Examples of such conditions could include: use of forehand/backhand only; jack not centred after casting; and only shots within two feet of the jack to count. 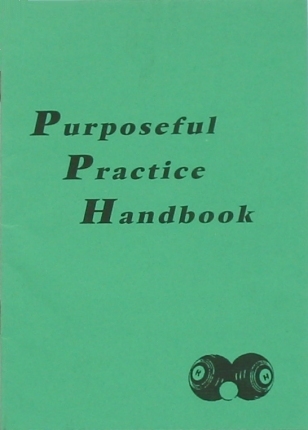 The Purposeful Practice Handbook provides a range of practical exercises that will assist bowlers at many levels and deserves wider recognition than it currently attains. For a very similar online version of this book go to Purposeful Practice Routines*. And the Purposeful Practices ebooklet*, intended primarily for newly qualified coaches, is another very useful resource.